"Creating value through interaction is far more important than solving a consumer’s problem in thirty seconds." Permission Marketing: Turning Strangers Into Friends and Friends Into Customers by Seth Godin delivers an in depth perspective on how leading digitally enabled marketing efforts follow an uncanny similarity to the management of technology. To manage the many moving parts, marketing has incorporated technology, data, and current rapid software development methods. Covering the topics of agility, innovation, scalability, and talent, Brinker walks the reader through the different parts of the marketing machine which are likely to change in your organization. "Before a marketer can build trust, it must breed familiarity. But there’s no familiarity without awareness." Permission Marketing takes the ‘relationships first’ principle from one of my other favorite business books, How to Win Friends and Influence People, and applies it directly to email and digital marketing. And while the book was first written in 1999, during the emergence of email marketing, the concepts still serve as a strong foundation of all digital engagement and customer experience. Email is inexpensive, novel and trackable. At the time, this was a greenfield for marketers who were struggle to rise above the noise. As the internet emerged as a standard tool for business and marketers, Godin tried to break the stagnant thinking of an ever present problem with marketers who are attempting to adapt traditional tactics to the digital marketplace. Godin sets us up by describing a situation where mass media is dying due to simply too much noise. Instead, niche media will emerge to match the diverse interests and needs of the dynamic marketplace. He also aligns this notion with how the marketers mindset needs to evolve to adapt to the more digital buyer-centric marketplace. Traditional marketers practice an “interruption marketing” mindset, whereas modern marketers practice the “permission marketing” mindset. Select a focused target audience — By focusing your budget to a specific audience, you can deliver more frequency within a concentrated period. An example Godin gives is Muhammad Ali, who became a great fighter by punching one opponent twenty times, not by punching twenty opponents one time. Varied messaging, similar theme — Many marketers will try to find a gimmicky, clever way to grab the audience’s attention. Like many SuperBowl ads, the brand is lost in the advertisement. Instead, Godin believes that marketers, having a select target audience, should focus on deeper, more relevant messaging for that audience. Coupled with the concentrated frequency, the promotions inspire trust. Achieving permission — Permission, the most solidifying factor in building a relationship and trust, requires that a marketer consider how their customer offers signals to them to leap to the next level. Buying an item, signing up for a newsletter, or some level of positive digital engagement are all valid reasons to build brand trust. Authenticity, relevance, and frequency will allow a brand to open the doors for long-term dialogue and profitability through customer retention and advocacy. "Permission Marketing is just like dating. It turns strangers into friends and friends into lifetime customers. Many of the rules of dating apply, and so do many of the benefits." The book is is all about building relevant relationships. Godin’s dating concept applies well to the arena of marketing. Marketers have traditionally been delivering one-sided conversations from the company’s own perspective without any regard to the interest or reactions of a brand’s audience. Through five steps, Godin describes the best way to work toward ‘marriage’. Make an offer — Every marketer must offer the prospective customer an incentive for volunteering their information and your permission to engage with them. Provide help — Using the attention offered by the consumer, the marketer offers a curriculum over time, teaching the consumer about the product or service he has to offer. Relationship reinforcement — An incentive has only a certain lasting effect. Work to build on that incentive or offer another relevant one. Get serious — Increase the level of permission the marketer receives from the potential customer by asking for more information about them or their situation. Get married — Turn permission into profits and continue to invest in the relationship. "Most marketers practice Interruption Marketing. The difference is simple. An Interruption Marketer is a hunter. A Permission Marketer is a farmer." As much of the book builds on trust and regular engagement, the analogy of Godin’s ideal marketer being a farmer makes sense. Hunting prospects as a marketer, at the time, had very little cadence and the success less predictable. It was inexpensive and required little research. It certainly rarely built on trust. The conversation was typically one-sided and very little was invested in the relationship after the transaction. Farmers, instead, required upfront investment of research, cultivation and planning. It would require constant diligence. However, once the prepared farmers became accustomed to the tools and environment, the crops (prospects) were a perpetual and predictable benefit. This allowed permission marketers to expand their farm and grow the company. Nurturing relationships through greater segmentation of your audience and delivering deeper dialogue with prospects does initially feel like it takes time and investment. However, the attention and trust yield higher profitability and brand premium. 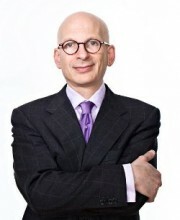 Seth Godin’s Permission Marketing will remain a classic for decades. As the competition for our attention exponentially rises as our attention span decreases, permission becomes a powerful asset. In every market segment, only a limited number of companies will be able to secure and leverage that permission. Another message for consumers is that you are in control and dictate who, what, and how you buy. Such a powerful message should bring more encouragement to marketers to improve the experience and preserve the trust. In reviewing any of your campaigns, are you trying to marry your prospect too quickly?